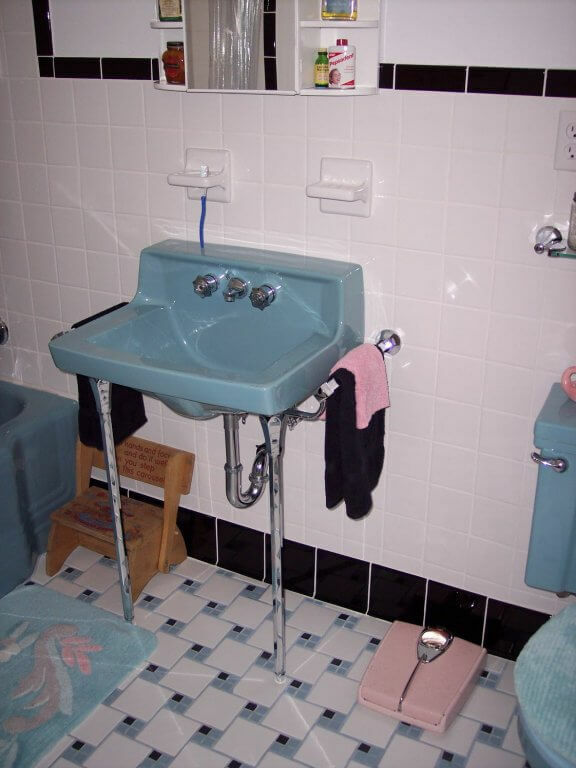 Your posting regarding sink legs reminded me that I needed to send to you some photos of my bathroom, now that the remodel of it is complete and the wonderful sink legs you sent to me are installed. 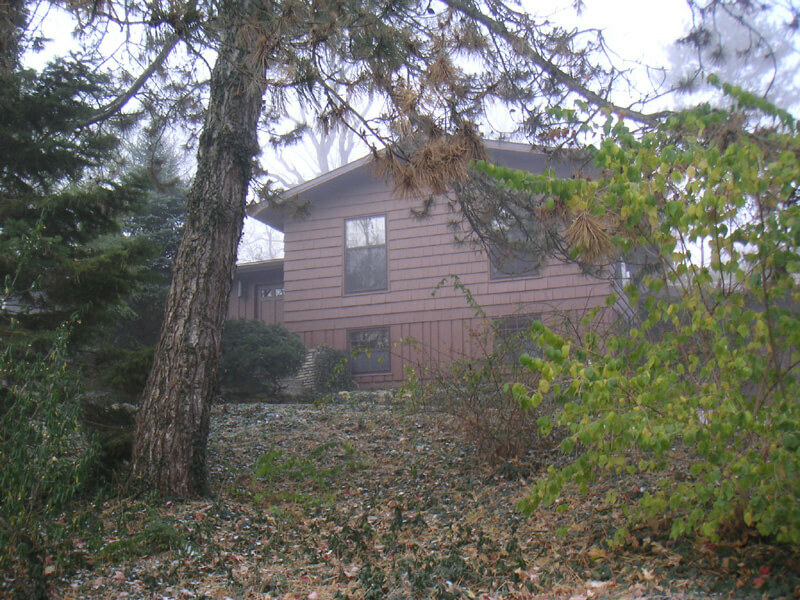 I am including a few “before” photos as well as a few “during” photos, in addition to the “after” photos. I will split them up into several emails. 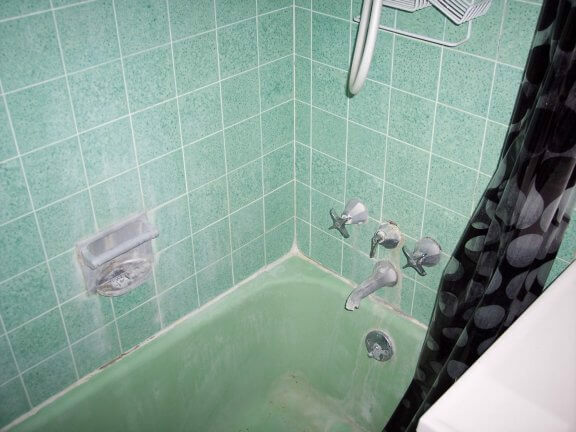 The bathroom started out with a hideous mottled green tile and green fixtures in a shade that reminded me of a hospital from the past … in a bad way. It was sickening. 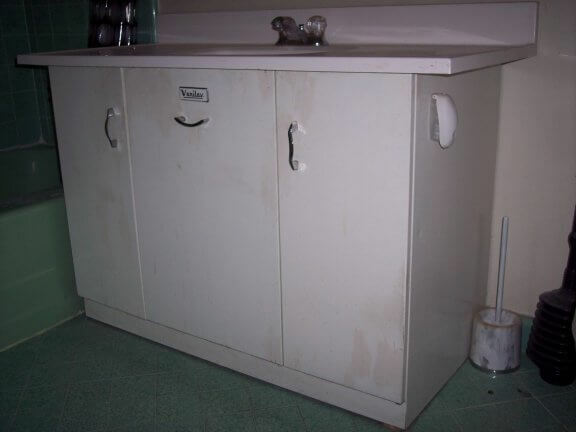 And much as I love metal cabinetry, the existing “Vani-Lav” made the room feel smaller and more cramped than it already was. 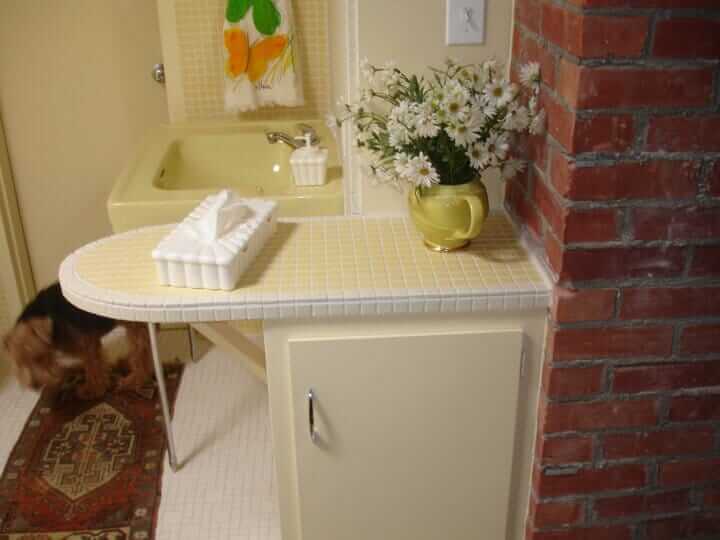 And the 1970s acryclic countertop with molded-in sink was awful. It all had to go. So I gutted the entire thing, to the wall studs and sub-flooring. And I did this while already living in the condo! I do not recommend that, as one must then rely on the kindness of neighbors for showering and serious toilet matters and empty paint cans for less serious relief. And if one is as unlucky as I was and the contractor suffers a stroke during the project … actually keeling over IN the bathroom while installing concrete backer-board! … the whole process can get delayed far longer than expected. I was without a functioning bathroom for over a month. 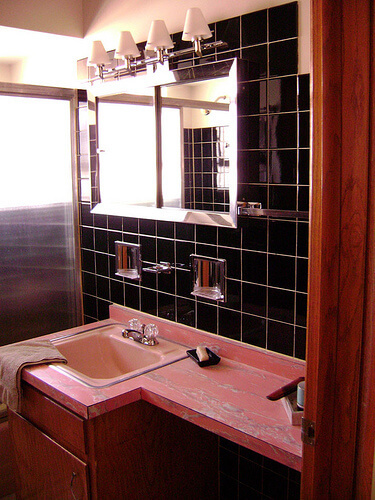 I wanted desperately to do the bathroom in classic 1950s true pink, not “rose blush” or one of those beigey-pinks that were common in the 1970s. I searched for about three months without finding fixtures in a true pink, however. So I instead settled on a great matched American Standard set in blue posted on eBay by City-Girl-In-The-Country, a wonderful dealer in Antrim, New Hampshire (citygirlinthecountry.com). 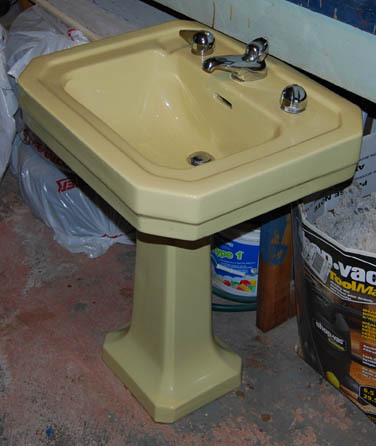 The set was date stamped: the toilet was manufactured on 11 June 1958, and the cast iron tub on 25 March 1958. Since my condo building was constructed in the summer of 1958 and I was keen to do an authentic restoration, the dates were perfect. The set cost $400, with an additional $800 to ship it in two wooden crates from New Hampshire to Palm Springs. Removing the existing tub and installing the new one in such a small space was a MAJOR chore, one that I do not recommend to any but the most adventurous. But while removing the old one, we found newspapers from 1958 that had been stuffed into the wall for some unknown reason. That was entertaining! 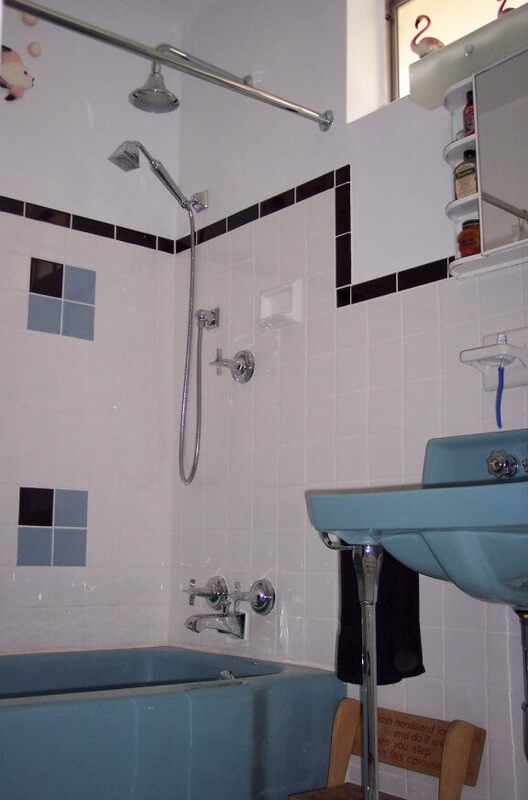 The tile is a combination of two brands. 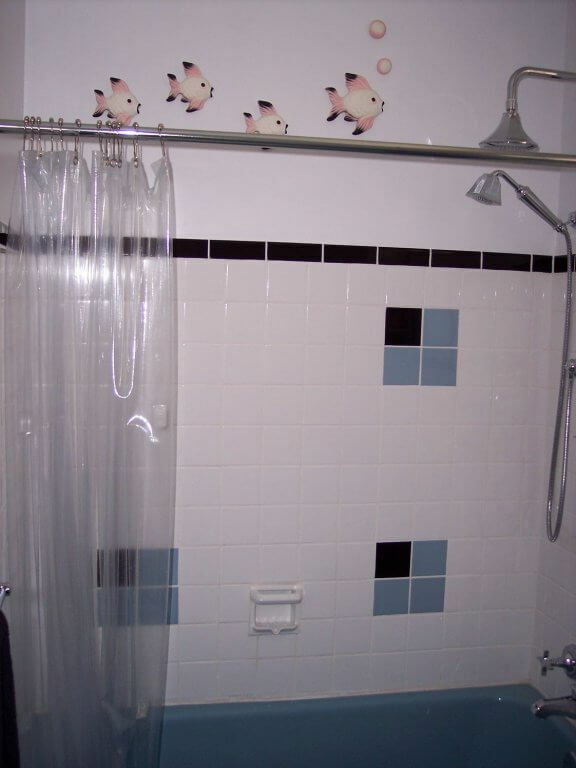 The walls are Dal-Tile 4×4-inch high-gloss glazed porcelain in Arctic White with 6-inch black trim pieces. 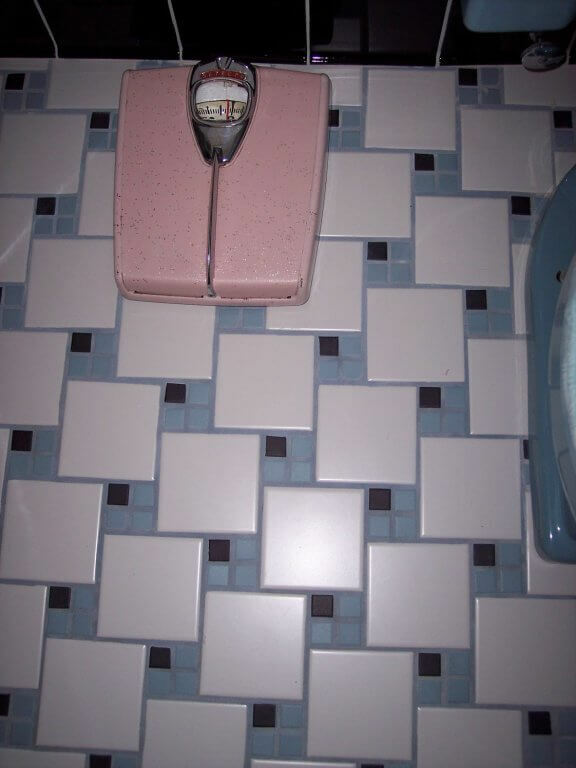 The floor is in a pattern that one of your contributors had in her all-original 1950s bathroom, and she had sent in photos just in time for me to duplicate the pattern in my own bath. The Ocean Blue and Black tiles are 1×1-inch Dal-Tile Keystone Color-Body porcelain, while the white ones are 4×4-inch Interceramic matte glazed ceramic tiles. The floor grout is Polyblend Sanded in a color that I mixed myself from two standard colors, Captain’s Blue and White, to match the fixtures. The ceramic accessories, including the three soap dishes, toothbrush holder, and toilet roll holder, all came from Eclectic-Ware.com. They matched the Dal-Tile Arctic White perfectly and are authentic 1950s shapes. The other hardware … tub/shower faucet and handles, shower head, and hand-held shower attachment … are Kohler’s Memoirs Classic line. Solid, heavy, and well made, but far more expensive than I would have liked. But the line has matching accessories … for a price! 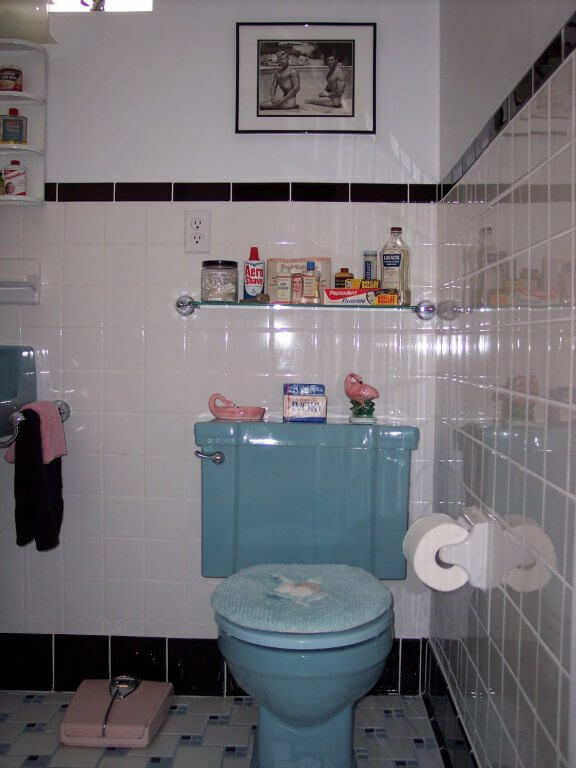 … so I was able to get a matching wall-mounted towel bar and glass shelf for above the toilet. Caution when buying Kohler hardware: the stems will not adapt to non-Kohler valves. I had to replace the tub/shower valve within the wall before I could install the Memoirs hardware, at a total cost of over $800 for just the valves and new copper piping. The actual Memoirs hardware, includuing matching towel bar and glass shelf, came to over $1600. 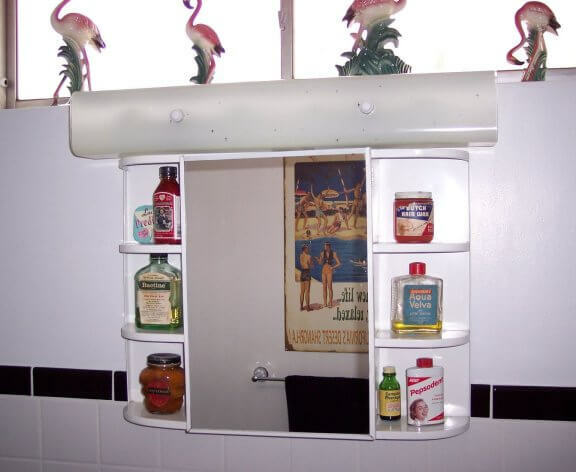 The mirrored cabinet above the sink is another eBay “find.” It was in mint condition and did not require any restoration, and it was inexpensive. The shelves along each side provided a great display space for some of my 1950s toiletries, all purchased on eBay, of course. The light fixture above the mirror came out of the apartment I had just moved out of. The landlord there wanted to remodel and modernize the bath, removing all traces of 1950s design and replacing it with modern beige cultured stone (sacrilege!). So I “appropriated” the light fixture when I moved out, with his permission. The other decorations and accessories, including the pink Detecto bath scale and chenille bath rug and toilet lid cover set are from eBay, of course. The Irmi children’s step-stool is from my own childhood. “Wash Hands And Face And Do It Well, When You Step On This Carousel.” The Palm Springs poster is a modern reproduction that is sold here in PS, giclee on tin, of a poster from the 1950s. It features tourists in and around a swimming pool with the legend “California’s Hot Spot! Palm Springs. Discover a new life … vibrant, gay, relaxed … Plan to visit California’s Desert Shangri-La!” Because I ended up with blue fixtures, I decided to design the bath around the poster. 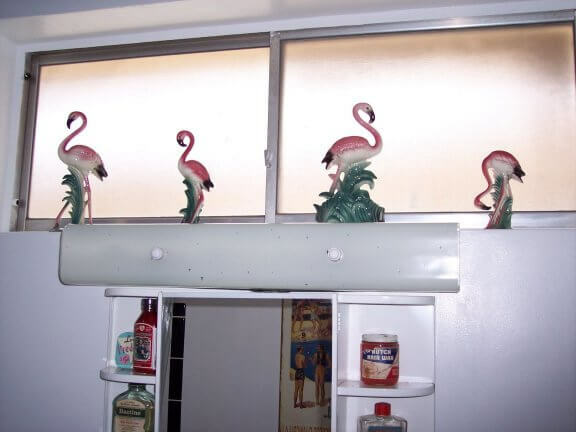 The photo above the toilet, another eBay treasure, is an original 1950s American Models Guild black-and-white of two physique models perched on the side of a swimming pool with aluminum lawn furniture visible in the background. I’m still looking for more poolside photos from the 1950s, but they are rare and unexpectedly expensive when they do appear on eBay. The project took longer than I expected and cost far more than I had anticipated and budgeted, but the end result is much better than I could have imagined. I am really very happy with my little 1958 bathroom. Oh how I love retro renovation, there is always more to learn around every corner… or in this case, behind every bathroom door. Thanks, PSS, you are the best! Help! 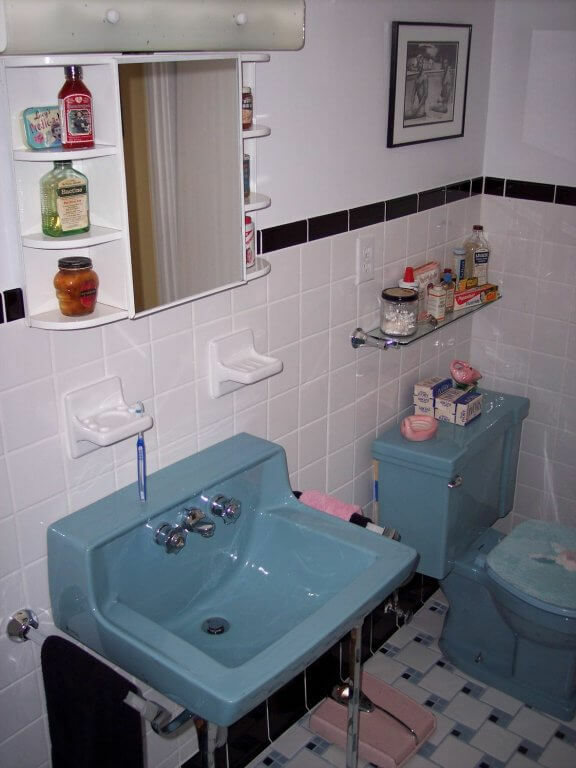 I have exactly the blue sink and blue toilet pictured above! Along with a blue cinderella bath tub. The toilet has stopped working. I have had several plumbers do their best to fix it but they can’t. Can you help me locate one?